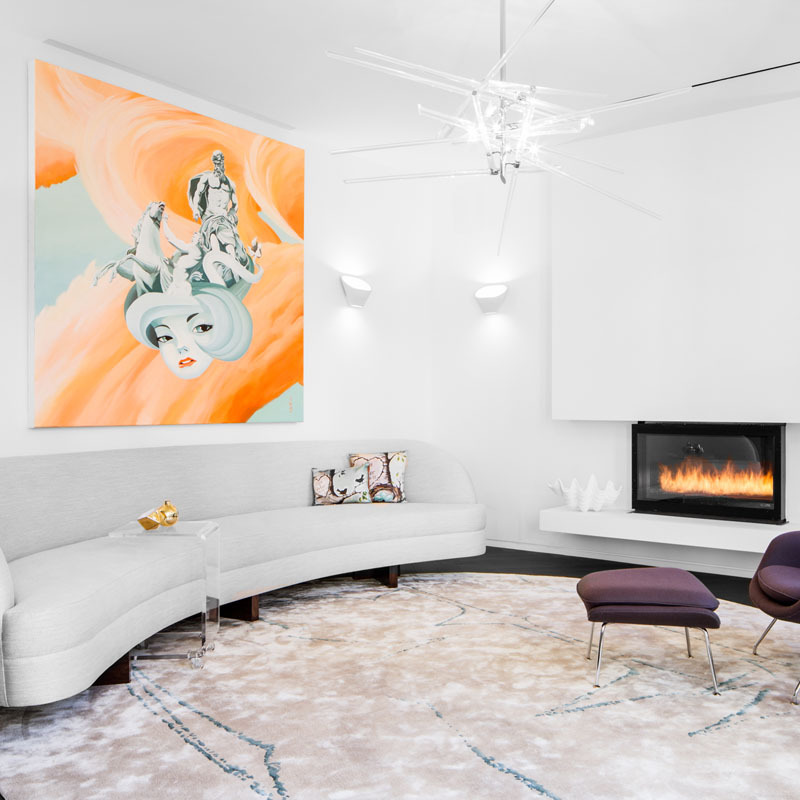 Referred to as the fifth wall, your ceiling might not be the first thing you think of when it comes to updating your home for added luxury, but ceiling design ideas can make a world of difference in making any home feel one-of-a-kind. From classic vaulted ceilings to a modern minimal ribbon glass-plated ceiling, there’s a style that’ll suit every home. And like with any home update, all it takes is a little research and intuition. 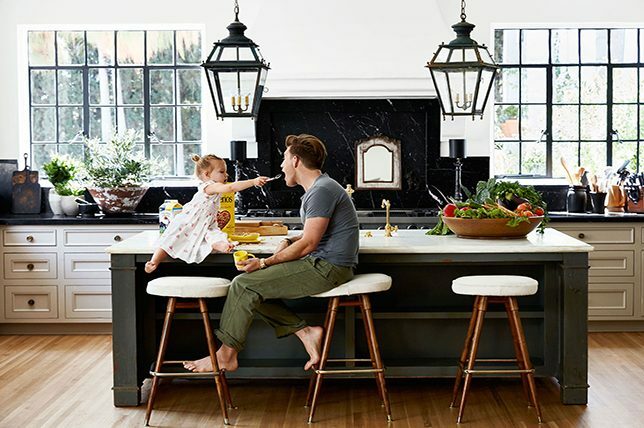 To help inspire you, Décor Aid renovation experts and interior designers teamed together to explore the top ceiling design ideas of 2019 for you. 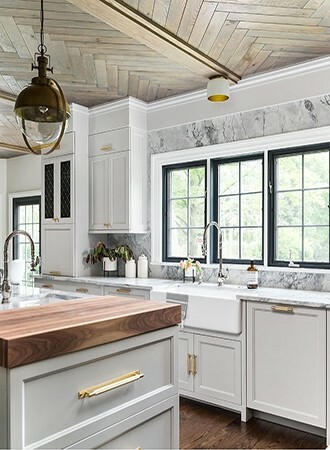 For something a little different than your usual painted ceiling, how about an intricate wood paneled herringbone ceiling? Ceiling design ideas are often plain and neglected, but a striking wood design will make a world of difference in your space. It will add an elegant focal point to a room without it being overbearing, and it will make a wonderfully cozy addition to ceiling ideas for your living room, den, and bedroom alike. A herringbone ceiling will also boost the value of your home since it is a costly option to consider. 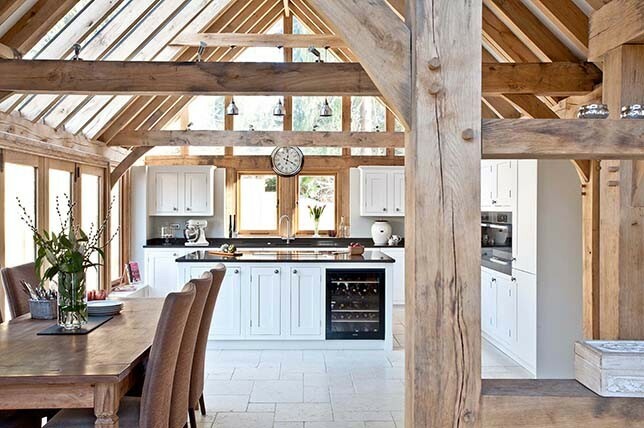 A vaulted ceiling with exposed wooden beams will give any home a grand and traditional feel with ease. If you have the space for it in your home (or are lucky enough to be building a new home from scratch) then ceiling design ideas like this are an incredible way to add statement-making character to your home. To stop it from feeling too imposing, make sure there is plenty of natural light and that you’ve painted the walls and the ceiling between the beams a light and bright color. 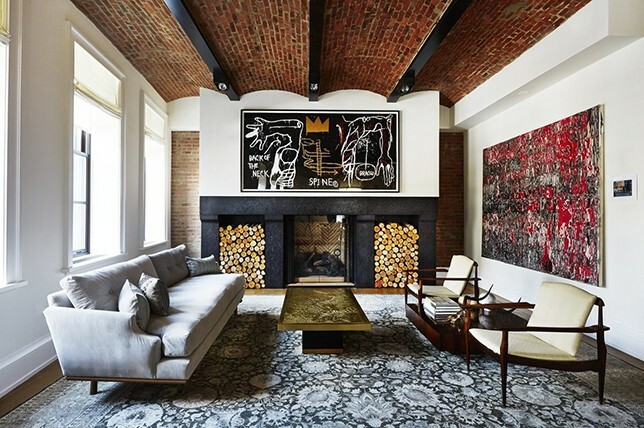 Your home will have a church-like appeal, making this certainly one of the more dramatic ceiling design ideas of 2019.
Who doesn’t love the look and feel of exposed brick in any room? 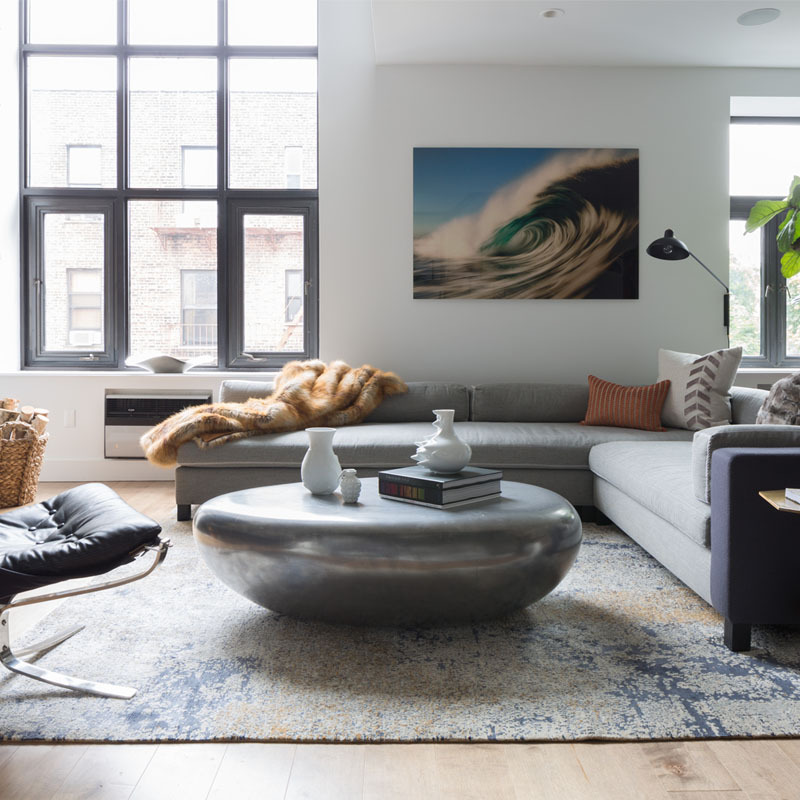 Whether you leave them natural or cover them in a coat of fresh white paint, exposed brick ceiling design ideas are sure to lend a comforting sense of warmth and texture instantly. The key here is to make sure that your exposed brick ceiling is coated so debris doesn’t fall from overhead. Energize a room with an unexpected coat of fresh paint boasting a unique and statement-making color for added visual interest. From bold electric blues to a saccharine pink, the sky’s the limit here. The other great thing about paint when it comes to ceiling design ideas is how affordable and easy to source of a solution it makes. 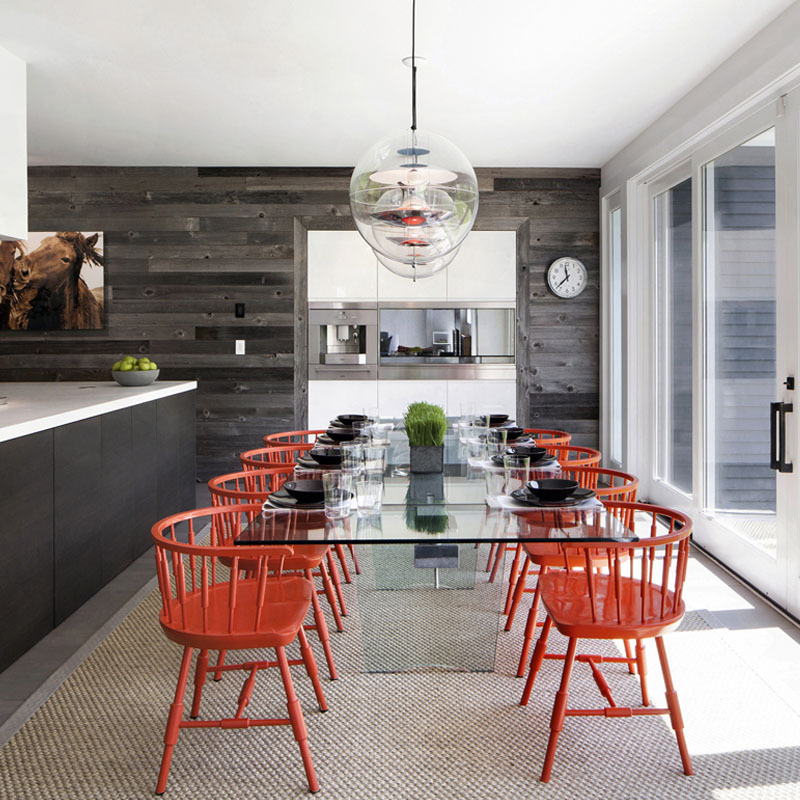 Just be sure that you opt for a color that isn’t too over stimulating to keep the look easy on the eye. If you’re on the hunt for game-changing ceiling design ideas, nothing beats a dramatically paneled ceiling, especially when curved. 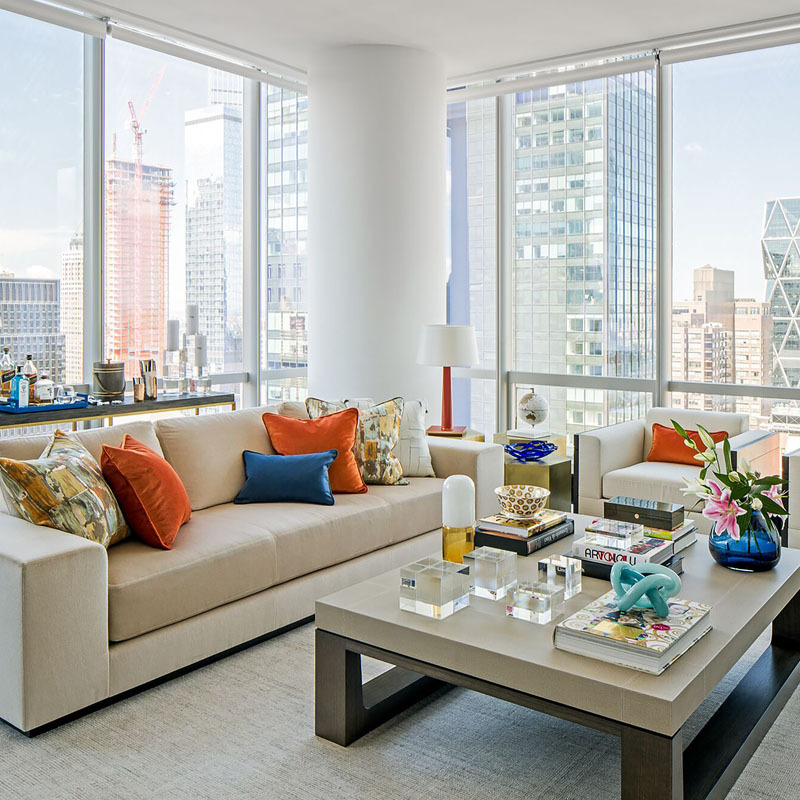 By adding panels above, you’ll make a room feel more luxurious and well-judged in one fell swoop. 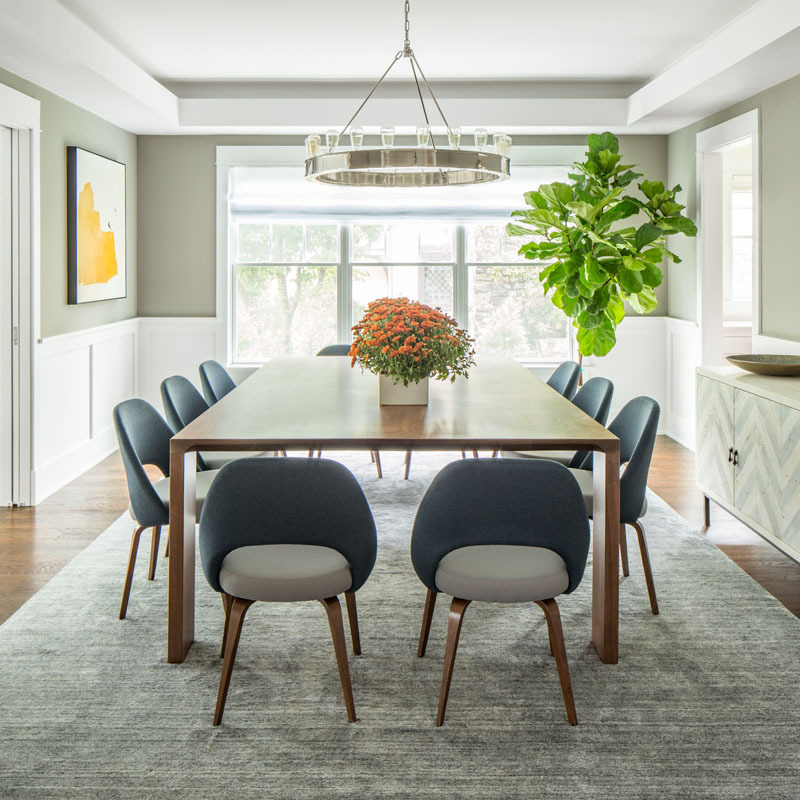 To get the look right, you’ll need to bring in the best local millworker so it holds up over the years as symmetry and seamless quality construction are paramount here. Much more affordable than custom panel ceiling design ideas, pre-cut shiplap boards are great for concealing uneven surfaces and they’re relatively easy to install and are inexpensive to boot. 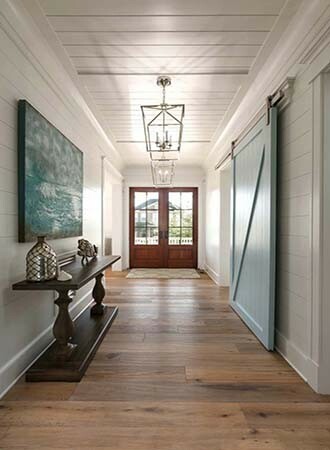 Plus, shiplap pairs well with several popular design styles including modern farmhouse, rustic, and coastal décor. Just like a mirror would, high-gloss ceiling paint will add a sense of everyday glamor to a room while making it appear brighter, larger, and more luxurious. That said, if your ceiling has any irregularities or blemishes, they’ll be magnified by a glossy coat, which will, in the end, drive anyone crazy. So be sure that your ceiling is in great condition before you begin updating it with a glossy coat of paint. 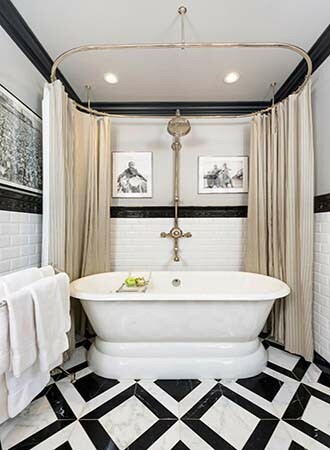 Channel the pragmatic spirit of ’40s-era interior design by painting trim and molding in a high contrast hue, like a dramatic glossy black for added effect. The best part? Ceiling design ideas like contrasting trim are easy and inexpensive to complete, and they don’t take much time or effort. For a modern Mid-Century-inspired feel, consider having your ceiling paneled with natural wood that will help absorb sound while lending a room elegant appeal. Add some dramatic flair to your ceiling design ideas by taking a cue from the heady and endlessly elegant Art-Deco era for a rich and decadent look. 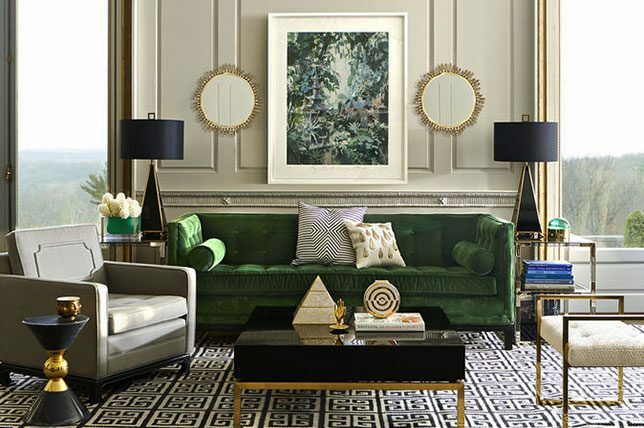 This can come through filigree ironwork, neoclassical moldings, and vivacious prints and patterns that feature only a handful of complimentary colors. If you want your home to look beyond luxurious and unique, then ceiling design ideas by way of a painted mural are the ultimate route. 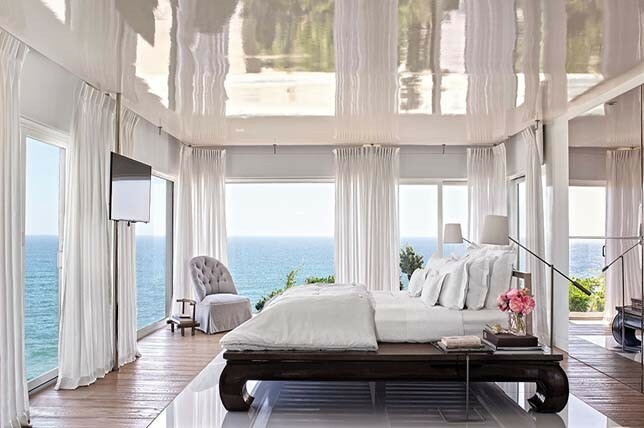 We haven’t seen many rooms which pull this look off, but when they do, they certainly do it well. 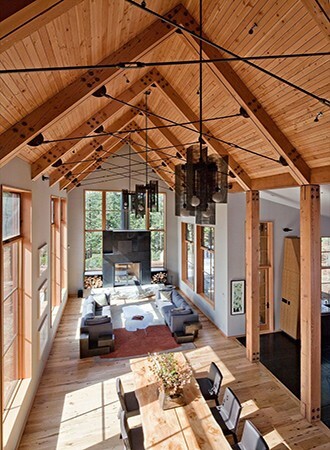 High ceilings suit this idea best, as otherwise, it can really make your room feel small and claustrophobic. From lively scenes to idyllic landscapes and even an intricate world map, the possibilities are endless with painted ceiling murals. Team a painted ceiling mural with plain and simple walls in a complementary color. 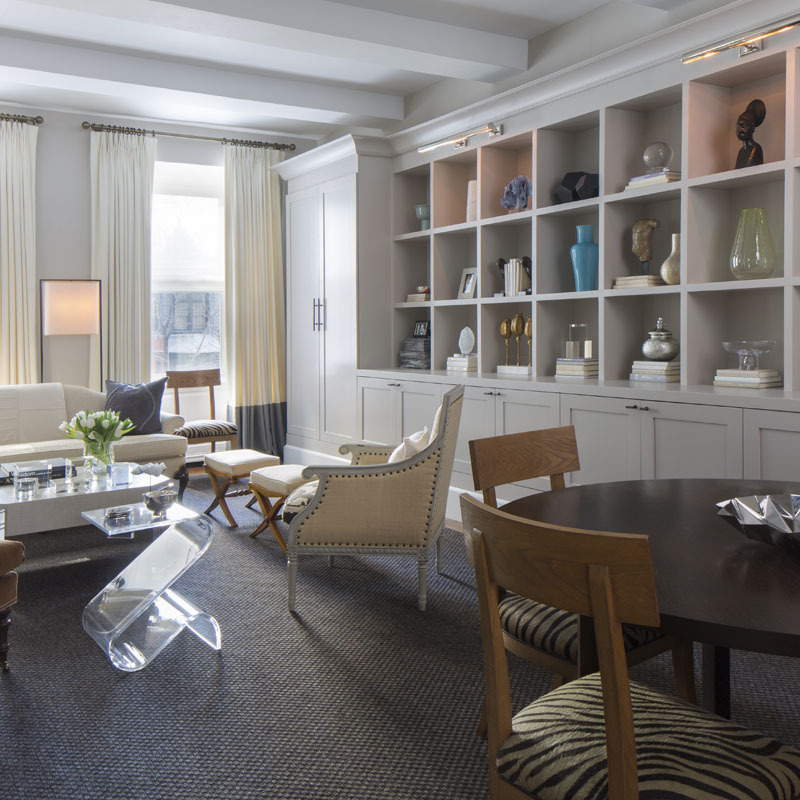 We won’t blame you if you’ve gone through life without having seen an upholstered ceiling. 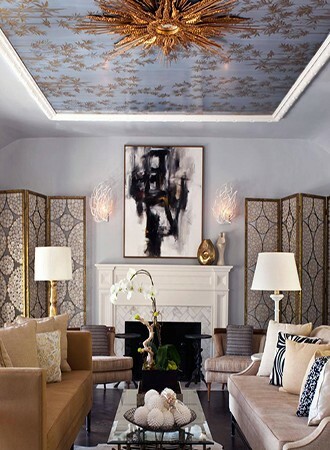 An upholstered ceiling will provide an unparalleled level of texture in your space that you can’t get with any other type of ceiling design ideas. We would suggest a simple fabric, providing your room with a subtle richness, but without it being too vibrantly patterned and too intrusive. 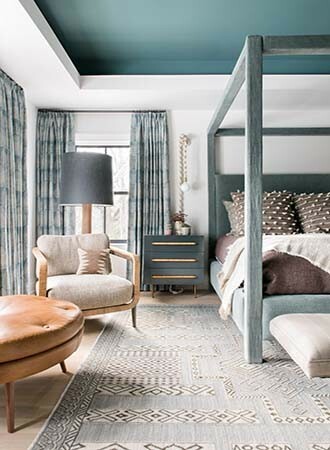 We think this design works best in ceiling ideas for your bedroom – you can even continue this design down your walls or use the same fabric to create a headboard – your room will be pure luxury. Plus, it’ll help absorb noise for a better night’s sleep. Our architectural team often suggests glass ceiling panels as they are striking modern and viable. 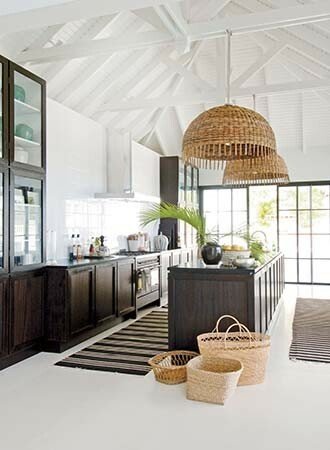 Glass ceilings are great for letting in an abundance of light, bathing your home in a wonderful glow. Ceiling design ideas like this are perfect for a well-used space, where everyone can enjoy the sky above, like in your living room. 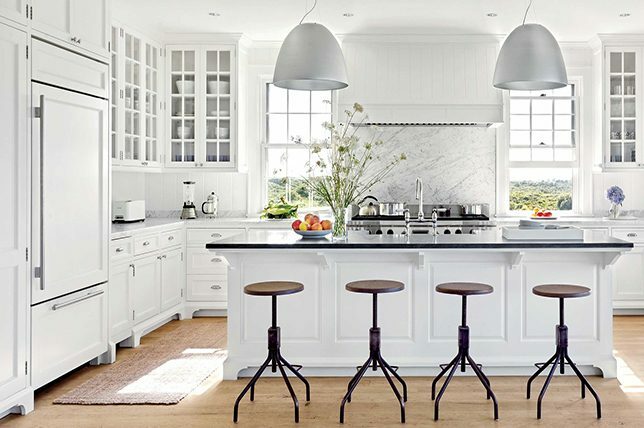 This is also one of our favorite ceiling design ideas for a kitchen, as the entire family will be able to bask in the warmth of the sun and eat dinner under the stars at night. Turn your room decor upside down (literally) and go for dark color on the ceiling and a light and bright color for the walls. This is a simple update, but its effectively dramatic and it will create a major impact in your room. 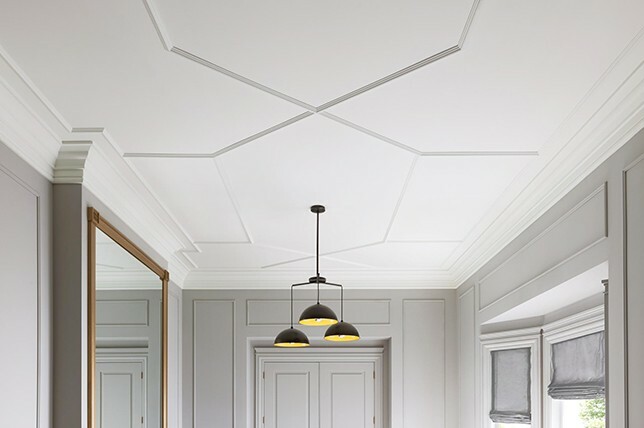 It’s one of our favorite ceiling design ideas of 2019, as it’s attainable for everyone. 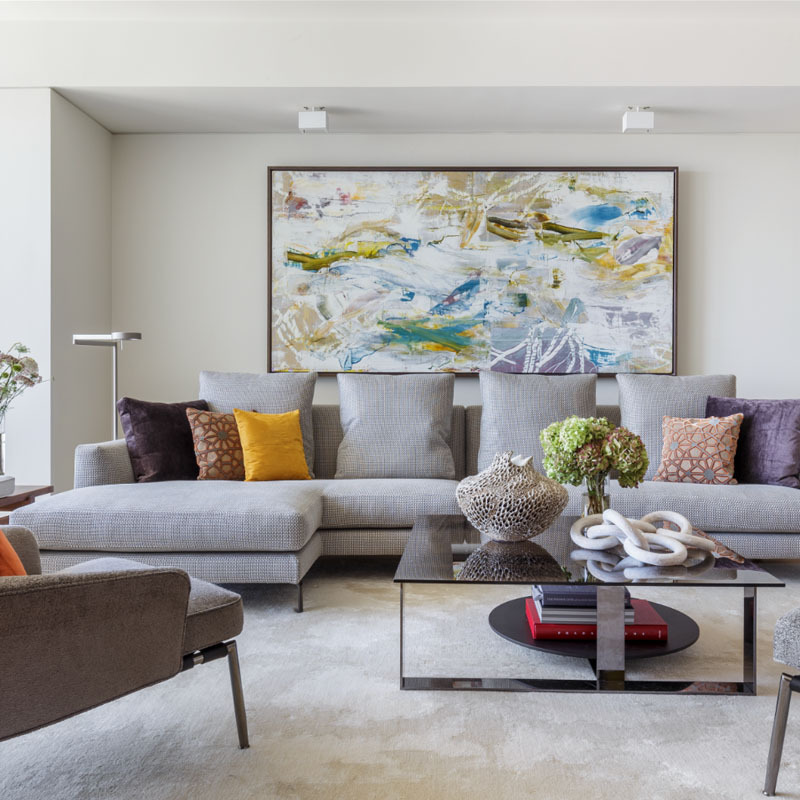 All that’s required is a simple paint job (no fancy structured ceilings here) and you can create a stunning space, which will feel unique to your home, without having to spend a small fortune. 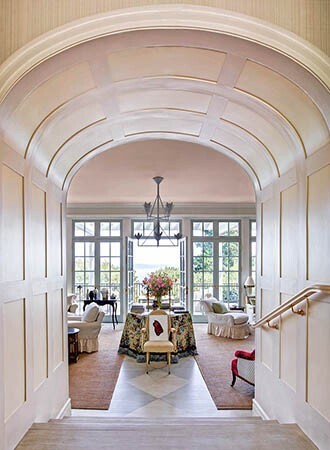 A barrel-vaulted ceiling provides smooth curves in a room, leaving your ceiling with an arch-like effect, reminiscent of a church or even a subway tunnel. A barrel-vaulted ceiling would look great tiled, to really embrace subway inspiration. Paint your ceiling white to add height and open up your grand space or panel it with wood for something with a cozier feel. 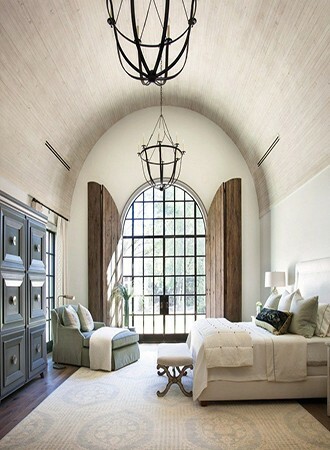 However you choose to execute your barrel-vaulted ceiling design ideas, it will look nothing less than fabulous. Visible rafters and beams add a huge amount of character to a room, but not every ceiling has exposed rafters or beams to offer. Fortunately, you can add faux rafters or beams to your ceiling design ideas without too much trouble. This looks great in both high ceilinged and low-ceilinged rooms, adding grandeur or creating coziness respectively. Rafters would look wonderful in a converted loft space, where you have different angles and dimensions to play with, and they would look amazing in a flat-ceilinged room for visual interest (one of our top ceiling design ideas for a bedroom to make it feel extra cozy). And they also pair well with all design styles, especially if you are inspired by rustic decor. 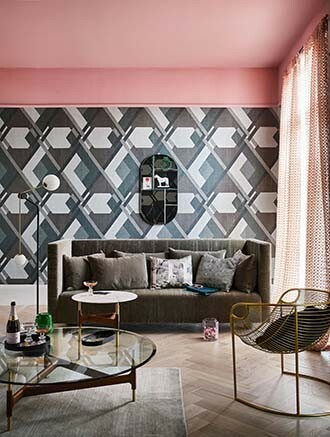 Geometry is still going strong when it comes to interior design trends, so why not introduce it in your ceiling design ideas for 2019? 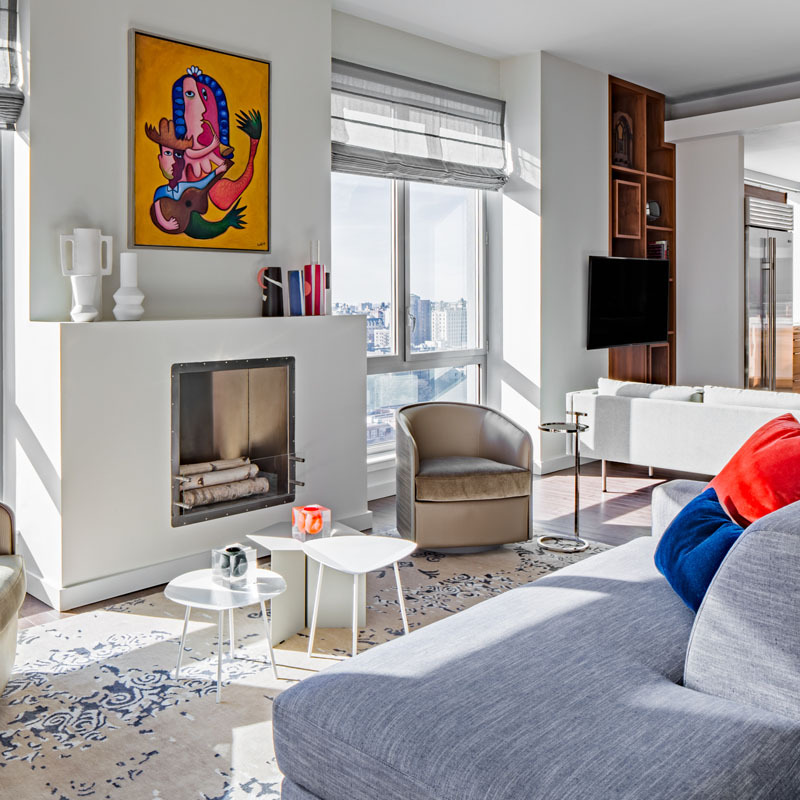 Teamed with a simply designed room, it will add depth and interest to your space, again, without it being too loud and obvious. Geometric molding will look wonderful in any wood color, from deep and dark tones to something lighter and brighter. This will be better suited to a higher ceilinged home, as adding a design like this to a lower ceilinged room will close it off. A tiled ceiling isn’t something often seen in home decor, but tiles are perfect ceiling design ideas for a kitchen and bathroom alike. A tiled ceiling will add a different dimension to a room, with the reflective properties of glossy tiles bouncing light around the room in a way that no paint job can. A tiled ceiling makes a statement in a completely different way than bright or bold colors will while helping to soundproof the space. Our interior designers recommend a neutral tone for a tiled ceiling as it will blend nicely with the rest of your room, allowing the focus to be on the tiles, rather than the color. 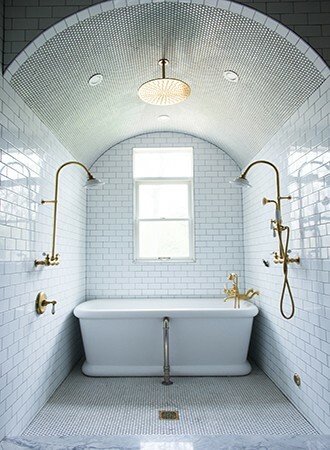 And for a bathroom, you can even use the same bathroom tiles for all surfaces for a comforting sense of continuity. If you want to add height to any space in your home, then a vaulted ceiling will certainly get the job done while boosting your homes resale value. Ceiling design ideas like this will add physical height to your space and painting your ceiling a bright white (rather than leaving natural beams exposed) will only add to that loftiness. 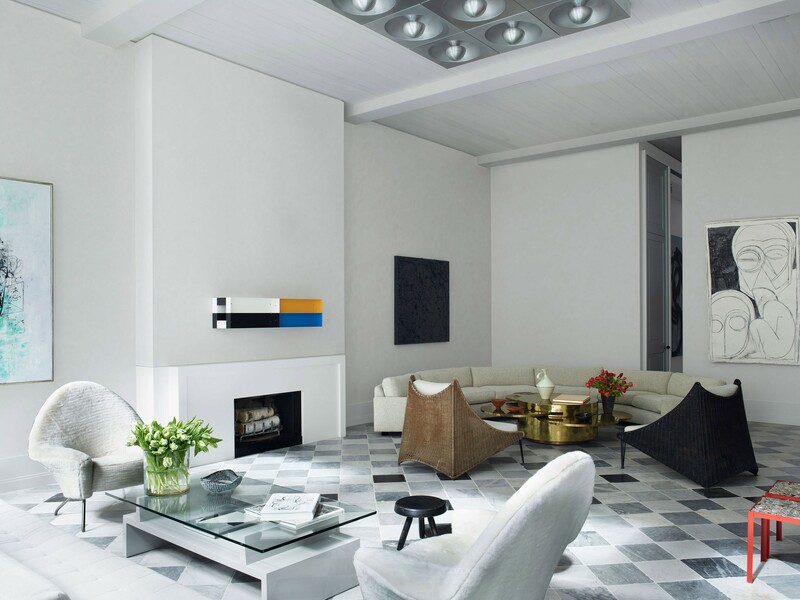 There is no better color to open up a room and help keep it feeling spacious than white, and your ceiling is no exception to the rule. Sometimes classic designs are the best, and it certainly works for ceiling design ideas in 2019. There is plenty to be said about the inspiring beauty of a skylight installation. 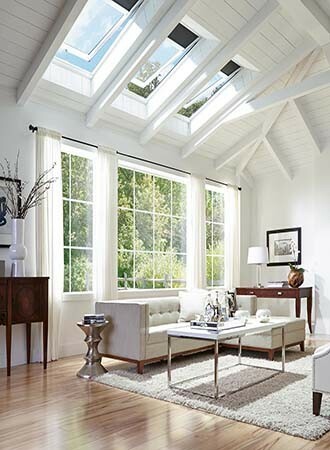 Whether you are looking to change the look of your ceiling, add a focal point, or let some natural light in, skylights are a great option. There are scores of different skylight designs that you can use to let light into your home, from flat skylights to domed or arched versions. Each provides you with a different look or feel. 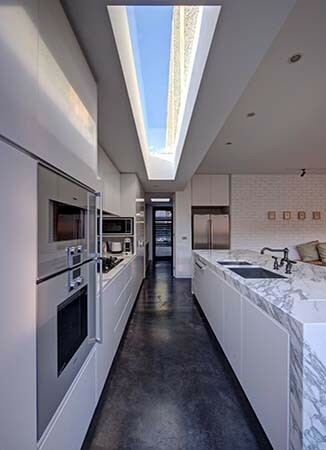 Skylights can become a defining feature when it comes to ceiling design ideas as they are much more dramatic than a simple window. Skylights are also great for livening up a dining room or a hallway or you can make them part of your ceiling design ideas for the living room. 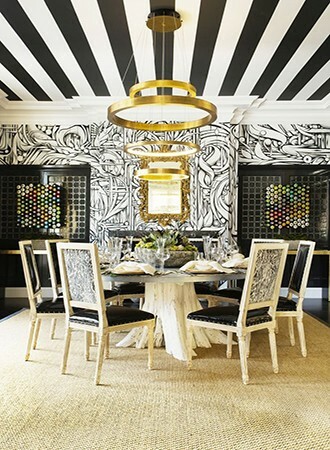 A striped ceiling will provide something more unique and unexpected than a standard ceiling design and it will work with any ceiling height. 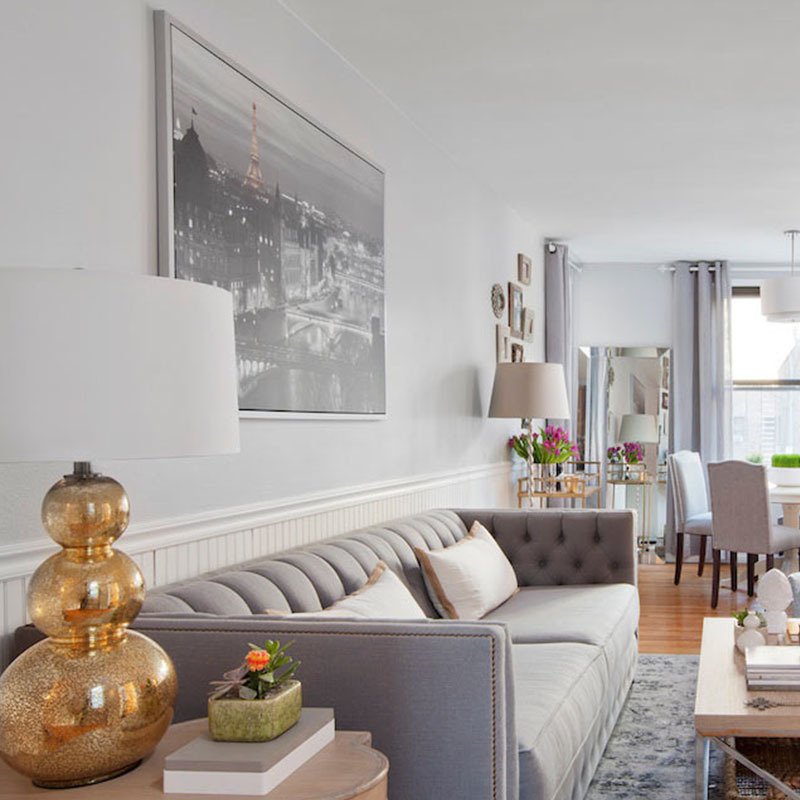 Go for light and neutral stripes to open your space up or go for something bolder with darker colors to lend a room a sense of intriguing drama while making it look grander. 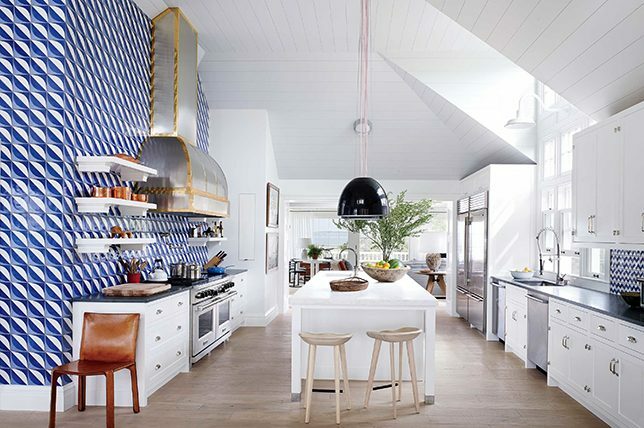 Whichever way you choose to bring in stripes to get the most out of your ceiling design ideas, your ceiling will be sure to look one of a kind. Long gone are the days of mirrored ceilings evoking a seedy roadside motel. 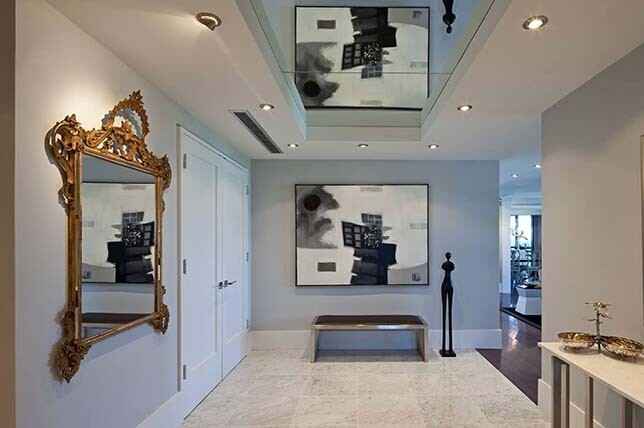 Instead, just like wall mirrors, a chic mirrored ceiling will make any space look and feel larger and brighter than it is, and it shouldn’t cost a fortune to install. Use them to your advantage in common areas like a dining room, family room, or entryway for a sense of everyday glamor that’ll prove irresistible. Plus, they’ll pair well with just about any design style, from the traditional to the minimal.